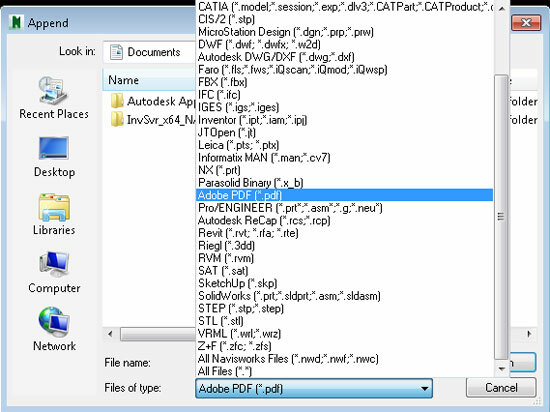 Autodesk Navisworks 2015 PDF reader facilitates the users to insert 2D PDF sheets to their Navisworks project. Apply 2D sheets and 3D models in a solitary project surrounding to take off quantities and evaluate your project. Organize your quantity takeoff through any of the 50+ file formats and now PDF as data source. Incorporate the PDF sheets in the project browser to be able to look through page thumbnails, rapidly jump to pages and set up the sheets as per your need or arrange all at once. Toggle among the 3D model and 2D sheets effortlessly. General Usage Instructions: The users will be able to include PDF sheets to the project throug the “Append” command or the “Import Sheets & Models” command available in the Project Browser. The users have to set the scale by hand as PDF files do not have scale information. This can be easily performed by visiting menu View > Windows > Put in Scale by Measurement. Here the users can opt for one or more distances and put in the distance to determine the scale. The users can manage visual fidelity with the ‘Resolution(DPI)’ setting accessible in the Options Editor for the PDF File Reader. Press F12 and direct to File Readers > PDF. The default value is 300 and will be compatible with most cases. For having more detail, the users can raise this value, but be conscious of that this also augments memory requirements and may affect performance. The users may also reduce the value to lessen memory requirements. The users must refresh the sheet to re-import with the modified settings.